This is Mac OS 8.0. It was first available to have Platinum theme, a PowerPC native, multi-threaded Finder, greater customization of the user interface, performance improvements, and many more. 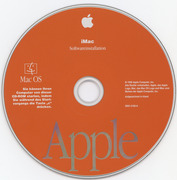 CD-ROM scan macos8.zip: Mac OS 8.0 Installation CD image. MacOS80_1400K.ZIP: Mac OS 8.0 floppy images. This is very hard to find as this disk set were designed for Macintosh computers without CD-ROM drive. Also, the Mac OS 8.0 Upgrade CD-ROM for Power Macintosh and PowerBook is identical from the original CD above, except some byte-to-byte changes from the Disk Tools image. 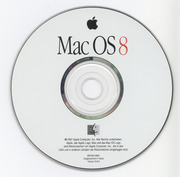 Upgrade CD-ROM scan MacOS80_UPG.ZIP: Mac OS 8.0 Upgrade for PowerMac/PowerBook CD-ROM disc image. 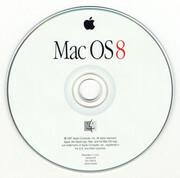 This is the Mac OS 8.0 CD-ROM special edition for Apple Internal use. It includes the base Mac OS 8.0 installer as well some extra goodies that were exclusively available internally for Apple employers such as Mac OS 7.5.3+7.6 installer, several Apple software such as AppleShare Server and Bar Code Font, several site licensed software such as Acrobat Reader 3.0, ClarisWorks 4.0v5 and NOW Utilities 6.7 and other nice software. 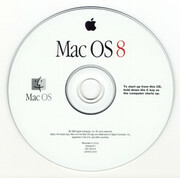 MacOS80_Internal.ZIP: Mac OS 8.0 Internal Edition CD-ROM image. Mac OS 8.1 Update is the update which fixes any bugs present in Mac OS 7.6 in additions with new features such as PowerPC Interrupt Extension, 54xx/64xx Update, and so on. The CD-ROM version below will install 8.0 first followed by 8.1 update, LaserWriter update, Open Transport update, and other components. 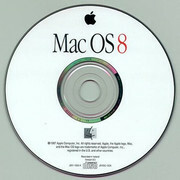 CD-ROM scan Mac OS 8.1.zip: Mac OS 8.1 Installation CD-ROM disc image. 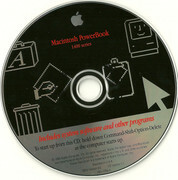 Original disc image for restoring a PowerBook 1400 computers. It includes base Mac OS 8.0 with some PowerBook extras and the restoration image. Restore Contents: Mac OS 8.0, Adobe Acrobat Reader 3.0, America Online 3.0, Apple Remote Access Client 2.1 installer, Claris Organizer 2.0v2, ClarisWorks 4.0v4, Adobe Type Manager 4.0, Eric's Solitaire Sample 1.0.2, Apple Telecom 3.2, Apple Address Book 1.0.3, Apple Fax 1.0.4, PowerBook 1400 Demo, Apple Internet Access 1.0, and other extras. CD-ROM scan PB1400CD_80.ZIP: CD image containing Mac OS 8.0 installer and restore hard disk image for PowerBook 1400 series. Original disc image for restoring a Power Mac G3 Beige Minitower/Desktop. 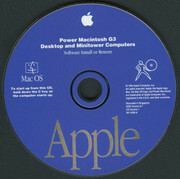 It includes the normal Mac OS 8.0/8.1 with the components required to run in Power Macintosh G3 Beige System. For other Macs, use the original Mac OS 8 installer via Software Installers folder and then use Mac OS 8.1 update by downloading above. CD-ROM Scan. PMG3_80.ZIP: CD image containing system software for Power Macintosh G3 and other programs. Revised version to have Mac OS 8.1 and updated features. 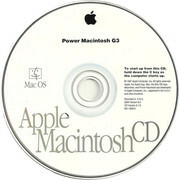 PMG3CD_81.ZIP: CD image containing system software for Power Macintosh G3 and other programs. 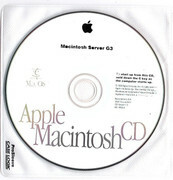 Original disc image for restoring a Macintosh Server G3. It includes the normal Mac OS 8.1 with the components required to run in Macintosh Server G3. Also, this disc includes some useful server goodies like Apple Network Admin Toolkit, AppleShare IP 5.0.2, SoftRAID 2.0, and Virex 5.8.1 WS. CD-ROM Scan. 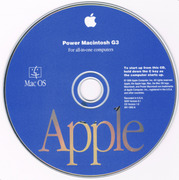 PMG3SVR_81.ZIP: CD image containing system software for Macintosh Server G3 and other programs. Original disc image for restoring a Power Mac G3 All-In-One. Since this CD is specifically designed to Power Mac G3 All-In-One, it includes the components that does not run from the Power Mac G3 Desktop and Minitower version of the installer. Also, inside the CD Extras folder, there is Mac OS Tutorial which is different than Macintosh Tutorial in 1994. CD-ROM Scan PMG3AIO_81.ZIP: CD image containing system software for Power Macintosh G3 AIO and other programs. Original disc image for restoring an original PowerBook G3. It includes the normal Mac OS 8.0 with the components required to run in PowerBook G3 System. Restore Contents: Mac OS 8.0, Adobe Acrobat Reader 3.0, America Online 3.0, Apple Remote Access Client 2.1 installer, FAXstf installer, Eric's Solitaire Sample 1.0.2, Virtual Pool 1.8.9, Now Up-To-Date & Contact 3.6.5, WebWhacker 3.0, Apple Internet Access 1.0, and other extras. PBG3CD_80.ZIP: CD image containing system software for PowerBook G3, restoration image and other programs. 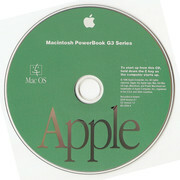 Original disc image for restoring a PowerBook G3 Series. It includes the normal Mac OS 8.1 with the components required to run in PowerBook G3 Series System. Restore Contents: Mac OS 8.1 with PowerBook G3 Series Enabler, Adobe Acrobat Reader 3.0, America Online 3.0, Apple DVD Player 1.0, Apple Remote Access Client 3.0 installer, Eric's Solitaire Sample 1.0.2, WebWhacker 3.0, Apple Internet Access 1.0.3, and other extras. CD-ROM scan PBG3CD_81.ZIP: CD image containing system software for PowerBook G3 Series, restoration image and other programs. Mac OS 8.0 and 8.1 requires the PowerPC or 68040 Macintosh. 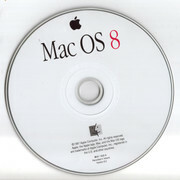 There is a special volume of Mac OS 8.1 with a modified system file that will allow it run on a Mac IIfx here: http://macintoshgarden.org/apps/mac-os-81-a-mac-iifx-or-maybe-just-a-68030. Please add the 8.0 to this page and the 8.5 to the 8.5/8.6 pages, thanks. How can I contribute to this page? I'm having problems with image PMG3CD_81.ZIP. I have downloaded this a couple of times and burnt various images. It boots up on my beige PM G3 revD and the installation process always stops at 'Cannot install Applevision'. Skipping over this it starts having problems with not finding an internet connection, then OpenTransport and various other things before it starts complaining that it cannot find a previous installation of MacOS on the target disk and giving up. I added a set of Disk Copy 6 images at the end. The zip contains MacBinary encoded disk images. Can someone please reupload the floppy disk version of 8.0 so that it will run natively on a real mac? It's currently .dsk images for an emulator and you can't do anything with them on a real mac. I had the same problem with the Mac OS 7.6 disk images and someone was nice enough to fix it and upload them. Thanks! I think my links work. The "PM" word reads "PowerMac", so I don't think these files must work within the 68k emulation. Yeah, many links are broken because the suspension of my MediaFire archive forever. Now I don't have many ideas to re-upload it all, since I don't have any internal server. I think I understand now. If the Basilisk II Router is set in the network tab of the emulator, then you need to manually configure the IP (as shown at Emaculation) in the emulated OS. If using Slirp, then you use DHCP in the emulated OS. Thanks for the upload and the help! Hi TrajkLogik, recent builds of BII or SS come with the BasiliskII SLIRP feature included. Slirp is what you want, if you would only like to route the host´s IP address to the emulator. Slirp however, will not give you real networking access inside emulation. Emaculation.com is hosting the emulator's executables with slirp and some guides. I was able to install this in Basilisk II, but I'm not able to surf with IE or Netscape - Basilisk just locks up. I also have 7.5.5 that I load with Basilisk II and I'm able to surf with iCab. Under the Basilisk II Network tab, Ethernet Interface is set to Basilisk II Router and FTP ports is set to 21. Is there anything I'm missing, or maybe failed to install correctly? Thanks. The eMac was booted in 9.2.2 but I don't think it really matters. I do think so, too. I've modified some Disk Copy disk images in order to boot Mini vMac with, installing Mac OS 7.x on that disk image while running Mac OS 9 native. Booted Mini vMac successful. Great! Just downloaded this image, burned it into a cd-r with Disk Utility in 10.4, bootable by default obviously. Used it to boot my Centris. Wanted to make an exact copy of my Centris internal hard disk so I booted from this disc, ran Disk Copy from the hard drive in my eMac and saved the disk image on my eMac hard drive using AppleTalk. The eMac was booted in 9.2.2 but I don't think it really matters. Anyone has this release in Italian ? bertyboy: I was burning at 1X. My bad though. I had forgotten to lock the .iso prior to mounting it in Toast. I just did that and the file burned at 2X and verified. I'm going to check this disk now and see if I can install OS 8. [EDIT] OS 8 successfully installed with no error messages. So the past error messages were because the disk had not verified. What about reducing the burn speed ? Update: Also, when I try to install 8.1 (and this should allow me install 8.0 since it's a full version) on a real Mac, with an erased 4 GB formatted HD in Mac OS, I get one of two errors and cannot proceed. One error is low memory, where I need to adjust the installer memory to more than 750K, and the other error is a disk error message. Of course I cannot adjust the memory of the installer program since it's on a locked disk. Three times I've tried burning this image with Toast and each time the disc burned, yet failed verification. I'm using the same CD's that I've had success with (Sonly). The first time the disk failed to verify was weeks ago, and and then it failed verification two more times today. I've been burning other disks all along so I'm pretty sure it's not my CD/DVD burner. Does anyone have any idea what's going on? The error code for the last failure was: "Mismatch at byte 11/sector 590. Verification failed." I don't have a problem installing or running 8.1 on Basilisk II. I can't vouch for this particular .iso download though, I have an original CD which it boots up from and installs. Someone got it running in Basillisk // ? It asways crashed when I booted from the image. Well, Mini vMac will come to that point sooner or later. I just used the Legacy Software version with the iMac installer to install 8.1 on my rev a. Works like a charm! Well of course the rev A iMac won't like it, it was released with Mac OS8.1 + a few minor updates, the Mac OS ROM being one of them, as well as video drivers for the included card (Rage 128 from memory), modem, CD drive and USB. I had one of these Bondi Blue rev.A iMacs, I uploaded both the Install and Restore CD images to MU - they're not there any more but there were 80+ downloads by members of this site so someone will upload it again. With Toast: lock your image of OS 8.1, mount it. In Toast (my version is 5.2.3 but this applies to other versions) choose the tab 'Other' then 'Mac Volume'. Click button 'Select', choose the mounted image. Uncheck 'Optimize on-the-fly', check 'Bootable' and burn your disk. This should produce a bootable disk or has done so for me. With the older versions of Toast, you had to point out a bootable volume with a Sytem folder IIRC. Anyone with information extending or correcting this is most welcome! I have yet to find one OS 8.1 image that's bootable, including this one. They have all refused to boot on every machine I've tried them on. I've burned them with Toast, Disk Utility, Nero (Windows) and Alcohol (Windows) and they still refuse to boot. I've downloaded dozens of different OS 8.1 images, all with the same result. What is the secret here? Every other OS image I've burned works fine. 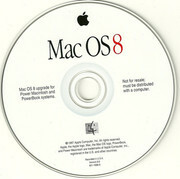 any chance to get mac os 8.5? and that's the one I use in Sheepshaver, that might work for you too. You guys are awesome. Since I've gone intel, i've been looking really hard for ways to run all of my favorite classic games and Mac OS 8.1 on my MacBook. Thanks to you guys, my long, tedious searching is two-thirds of the way finished. Now all I gotta do is install softmac on my windows xp drive, and I'll be back in business. It has two disk images: Disk Tools 1.img and Disk Tools PPC.img. I assume the first one is for 68K machines. does this have the floppy images included? I Agree, that 8.1 is the Best Classic Mac OS. I am so glad I kept the Original CD and brought it with me when I came back to Mexico. HBeagley - I did the exact same thing, runs great! But I got a Performa 5400. 8.1 is pretty much the best old Macintosh operating system. No update needed, 8.1 already installs by itself. (As in the second screen shot). Does it directly install 8.1 or does it install 8.0 then apply the 8.1 update? I would like this asap!